I’ll start out with a disclaimer on this post: My meal at Luxbar was essentially free, so I’m going to be honest and say that it probably effects my review. But read on…. When I was first planning our trip to Chicago, I asked the authors of another blog I follow, Passport Delicious (who is currently based in Chicago) for some recommendations for Sunday brunch. One of the places she recommended that might be fun was Luxbar, a Near North bar known for it’s burgers, small plates, and somewhat trendy scene (and, IIRC, it’s run by the same folks as Hugo’s Frog Bar down the street, where I seem to have been at least a half dozen times as part of conferences in Chicago). It looked interesting, but then discovered that our group already had other plans for brunch at The Publican (which I’ll be reviewing in a few days), so we had to change our plans. We ended up deciding to go to Luxbar for breakfast on Friday instead. While Luxbar has been doing Sunday brunch for a awhile, they are actually fairly new to the weekday breakfast scene (more on that below). 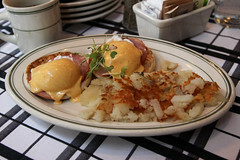 The menu is pretty much your standard breakfast fare, with omelets, pancakes, French toast, eggs Benedict, and the like. Nothing terribly fancy (aside from a few smoked salmon dishes), but they have the breakfast basics well covered. Myself, I opted for the eggs Benedict, since it’s one of my favorite dishes when done right, and always a good way to judge a restaurant. It’s basically a simple dish, but there are a lot of ways to both mess it up, and to make something wondrous. 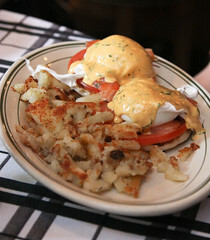 Well, Luxbar’s Benedict was a mixed bag. They got the two most difficult components pretty much perfect: the eggs were perfectly poached and silky, with the yolks warm and runny, while the hollandaise sauce was the perfect blend of tangy and creamy. But like so many other Benedicts I’ve had, it started to fall apart after that. The meat in this Benedict was a thin, cold layer of fairly lifeless Canadian bacon that really didn’t add anything to the dish, and that actually surprised me. For a city known both historically for pork products, and more currently for several good charcuterie places, I was really expecting something better. The English muffin wasn’t much better, served cold with a somewhat weak toasting. I think someone in the kitchen is laying these out well before the eggs and sauce are ready. The hash browns with the Benedict were also somewhat disappointing, with one of those textures that seems like they were steamed more than fried. Carol did a fair bit better with her Gravlox Benedict, since the salmon on it was a decently make house-cured gravlox, which did take the dish up several notches in quality over my regular Benedict. However, it still suffered from the weak muffin and underwhelming hash browns. However, Luxbar mostly redeemed itself quite nicely with one simple side dish to our main meal: after seeing a nearby table order a sticky pecan roll, we had our waitress bring one to our table. I’m rather glad we did, since this was a phenomenally good sticky rolls: Nice rich and fluffy layers of pastry rolled up in a rich (and almost savory) sticky caramel sauce with pecans that were perfectly toasted, this was basically an example of what the perfect sticky roll should be like. I can easily see myself coming back to Luxbar on another trip to get another of these little sticky rolls. If anything, that’s what frustrated me the most about this meal: there were quite a few things that Luxbar could obviously do well, such as the sticky bun, the hollandaise sauce, and even the gravlox. They have some really good coffee (from Intelligentsia). They can also properly poach eggs without killing them or leaving the whites running. But they also seem to fall flat on some of the breakfast basics, so the end result was quite mixed. So close, yet so far. And this is where I should mention why my meal was free. Throughout the meal, I got a really odd vibe from the waitstaff that I couldn’t quite place, like somehow today wasn’t “business as usual”. And they seemed a little disappointed I didn’t care for one of their bloody marys or another breakfast cocktail. And when our bill arrived, I was more than a little shocked, since our grand total for three breakfasts was… $4.90. 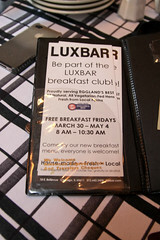 It took me a second to see the “Free Breakfast” discount on the bill, and another few seconds to see the insert in the bill advertising that Luxbar has been promoting their new weekday breakfast menu with free breakfast (except for alcohol and tax) on Fridays until May 4th (the day we visited). At that point the penny dropped: that’s why the place seemed unexpectedly busy. Why the place had an unusual vibe. Why the staff seemed to be pushing the alcohol a bit more than usual. This wasn’t business as usual. I had, completely unknowingly, stumbled onto a free breakfast promotion. Still, I was a little bit surprised, since if you’re trying to promote a new menu, it really helps to put your best foot forward and try and leave people wanting to come back, or to tell their friends. And I didn’t really get that, instead I got a feeling that if I had paid full price, I would have been rather disappointed. Overall, it was still a good breakfast. For the price we actually paid, a phenomenal breakfast. 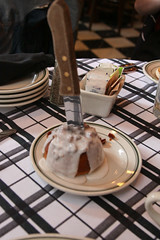 And the sticky bun alone will have me return at some point, either for a proper brunch or dinner when I can sample some items off of their more established menu. They’ve still got some work to do on breakfast.